I'm holding a slide show event with the legendary Arjen Uitbeijerse. 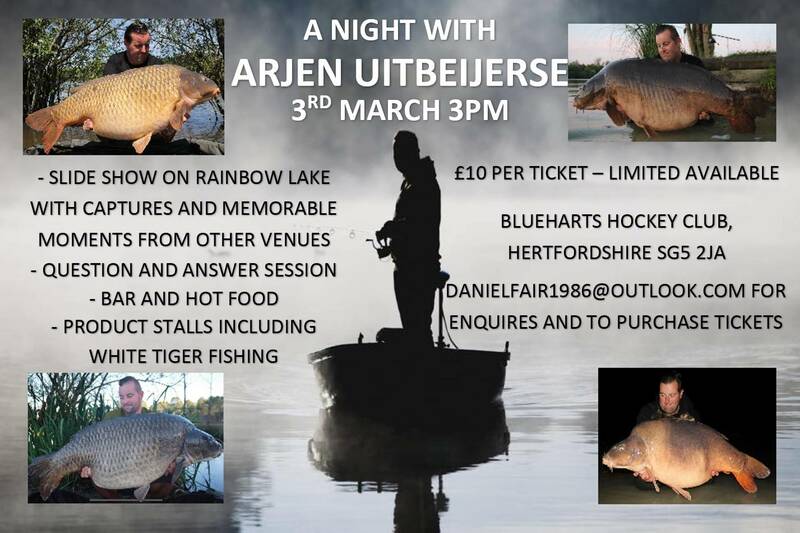 He is going to be talking about his time fishing Rainbow lake along with other venues across Europe. This is Arjen's first trip to the UK to do an event like this. Having caught 9 different carp over 77lb he will certainly have some stories to tell. Its happening on 3rd March in Hitchin, Hertfordshire. The show should last an hour or so with time for questions at the end. There is going to be commercial stalls from Eric Smith with White tiger products, Mad Baits and The lead Shed. There will also be the chance to buy hot food and a fully licenced bar. Tickets are £10 and brought from myself. Please email me on danielfair1986@outlook.com for info on how to buy them. If you have facebook you can see the event here https://www.facebook.com/events/270025220341875/.